Following the 1st Series in Seoul, Korea in 2008, Tokyo hosted the 2nd Asia Baseball Series at Edogawa-ku Baseball Ground on May 25 (Sat.) and 26 (Sun.) and the Team Japan (manager Tetsuhisa SADAOKA of ex- Hiroshima Carp and Hokkaido Nippon Ham Fighters) won both games against Team Korea 9-0 and 2-1. Chinese Taipei which was scheduled to join could not make it this time. 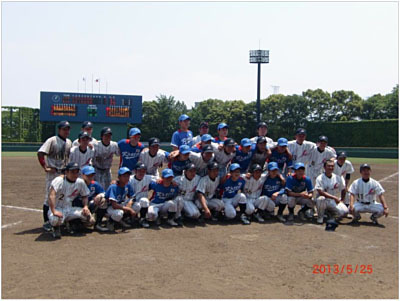 Deaf Baseball was played as a demonstration sport for 3 days from 26 May 2012 to 2 June 2012 (8 days) at the 7th Asia Pacific Deaf Games in Seoul, hosted by Korea Deaf Sports Federation. In Japan, there are about over 100 deaf baseball teams with about 2,000 players, comprising about 40 club teams and a number of schools for the handicapped. The total number of deaf players could be far more because they play among other people having no disabilities.